The HOS-MS420 Series digital oscilloscope is ideal for the plant, maintenance, trouble shooting, test benches and many industrial applications. The HOS-MS420 features a 96 mm (3.8") color LCD. The HOS-MS420 is also a true RMS multimeter which includes functions such as the measurement of resistance, capacitance, voltage, and current. The HOS-MS420 can display waveforms and data on your PC via the USB interface. 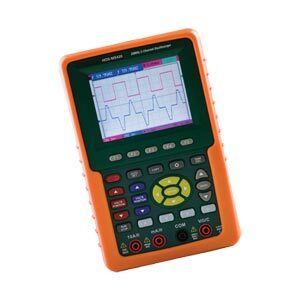 This oscilloscope/multimeter is a key tool for a variety of applications. Note: Comes complete with two 1X/10X oscilloscope probes, test leads, Windows® 95/98/NT/2000/ME/XP compatible USB software and cable, capacitor measuring module, adjustment screwdriver, AC adaptor/charger, hard carrying case and operator’s manual.